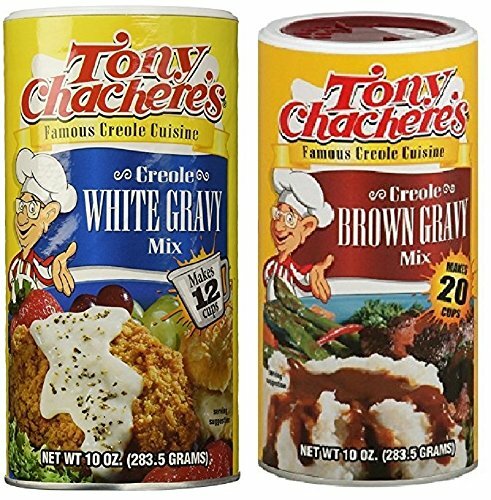 Tony Chachere's Creole Gravy Bundle - 1 Each of 10 Ounce White Gravy Mix and 10 Ounce Brown Gravy Mix by Tony Chachere's at 365 Days Of Kindness. Hurry! Limited time offer. Offer valid only while supplies last. Tony Chachere Brown Gravy Mix is a wonderful addition to your kitchen pantry. You can use it to enhance your mashed potatoes, chicken or other meals. Tony Chachere Brown Gravy Mix is a wonderful addition to your kitchen pantry. You can use it to enhance your mashed potatoes, chicken or other meals. This brown gravy sauce comes with enough to make 20 cups. It's fast and simple to prepare so you can get dinner on the table quickly and easily. This mix is seasoned to have a rich and bold flavor. It's completely free of fat and cholesterol, which makes it a smart option. At only 10 calories per serving it's easy to add into your diet plan. Make your own Cajun white gravy with Tony Chachere's White Gravy Mix. This white gravy mix is easy to make and adds great flavor to your favorite dishes. Add one tsp, cracked black pepper to Tony Chachere's White Gravy mix to make Pepper Gravy. Add one Tbsp butter to Tony Chachere's White Gravy mix to make Buttery White Gravy. Add one cup Tony Chachere's White Gravy mix to two cups of water to make a white roux. Makes real Creole Style gravy in just minutes! If you have any questions about this product by Tony Chachere's, contact us by completing and submitting the form below. If you are looking for a specif part number, please include it with your message.